Since a red LED, harmless to the eyes, has been incorporated as the beam source, you are free from strict laser safety regulations. Moreover, due to the red LED beam source, the measuring spot is visible, which makes positioning of the object simple. Its emitter and receiver are much smaller compared to those of the amplifier built-in type (LA-510). Hence, they can be installed even in a narrow space inside an automatic assembly machine, etc. For the analog output, in addition to the span adjustment function, a convenient shift function which enables the analog voltage to be shifted by ±0.5 V has been incorporated. 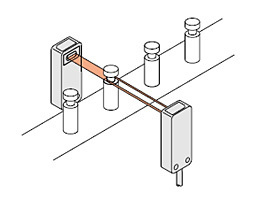 Beam alignment is easy by using the target label (accessory). Further, the 3-stage stability indicators on the amplifier indicate the incident beam level at a glance.